A Tuesday morning crash which killed two people, including an off-duty Chicago Police officer, raises new questions in the continuing controversy over high-speed police chases in Chicago. Phil Rogers reports. A Tuesday morning crash which killed two people, including an off-duty Chicago Police officer, raises new questions in the continuing controversy over high-speed police chases in Chicago. In the latest incident, Chicago police said officers thought they had spotted a car used in a carjacking on the West Side June 10th. In actuality, it was an off-duty officer. Investigators said he fled, eventually crashing into another car at Roosevelt and Kostner, killing 27 year old Chequita Adams. Why that officer allegedly fled isn’t clear. A source close to the investigation told NBC 5 Investigates that the chase was captured on numerous police POD cameras. And that efforts were underway to determine if a red-light camera might have captured the actual crash. 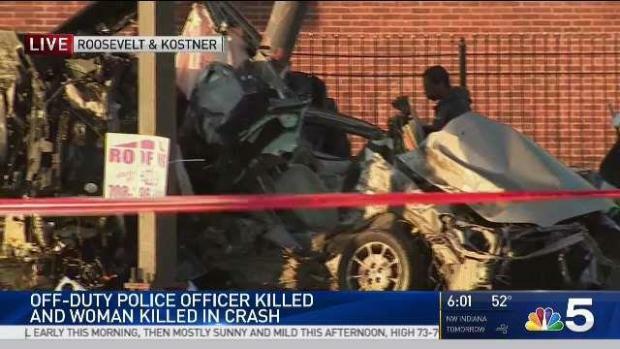 An off-duty Chicago police officer and a woman were killed in a horrific crash on Chicago’s West Side Tuesday morning. Lauren Petty reports. That General Order, updated in March of last year, says that a balancing test is to be used to determine the propriety of all chases, taking into account factors such as the volume of pedestrian traffic, weather and road conditions. Chases are not to be undertaken at all for non-hazardous traffic offenses, or if there is an “arrestee or non-law enforcement personnel” in the police vehicle. In the Tuesday morning incident, the pursuing officers, a gang team out of Area Central, thought they had spotted a black Jeep used in a carjacking two weeks ago near Augusta and Wood. In that incident, the offenders rammed a woman from behind, then took her car. The car in question had a White Sox vanity plate. So did the off-duty officer’s Jeep. But police concede it was the wrong car. But just 12 seconds later, it’s all over. In actuality, the incident began at Independence and Roosevelt, when the gang team said they saw the Jeep coast thru a stop sign. The intersection where the car crashed, was 12 blocks away. Romanucci contends the tragedy sadly illustrates the dangers associated with police pursuits in a congested city like Chicago. The Chicago General Order is 12 pages long, and describes numerous circumstances where chases should not occur. Romanucci argues that even at the level of a carjacking, if no one was harmed, a chase in a residential neighborhood is hard to justify.